Here you can download CRPF Constable Tradesman Admit card 2016 for Physical test, written exam and skill test. 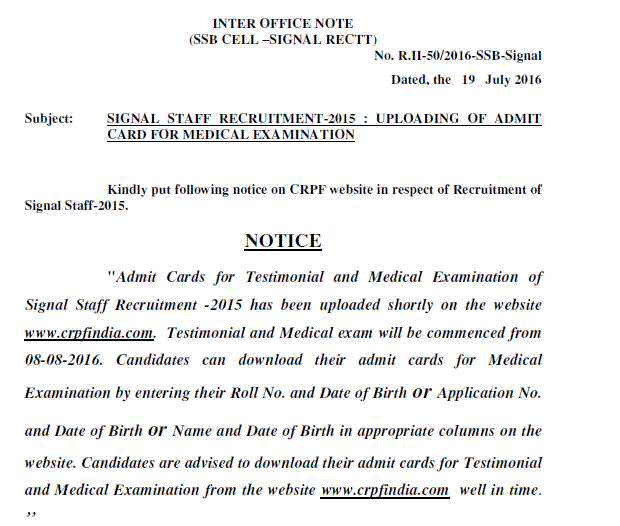 CRPF will release the admit card of Signal Staff Review Medical Examination on 29.09.2016. Eligible candidates can download it by following link. RME will be held from 26.10.2016. CRPF HC Min Admit card will be available a few days before exam. CRPF had released the admit card for Constable GD RME Exam. Review Medical Examination (RME) of candidates whose appeals have accepted for RME for CT/GD exam-2015 in CAPFs, NIA, SSF will commence wef 23/08/2016 onwards at various CAPFs RME centres. CRPF will organize Testimonial and Medical exam for Signal Staff from 08-08-2016. Admit card for this will be uploaded shortly. 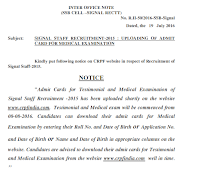 CRPF had released the admit card for Testimonial, Trade test and Medical of Paramedical Staff. CRPF had released the admit card of ASI Steno 2015-16. You have to click on the below given link in order to download it. Candidates qualifying in PST and Document scrutiny will be called for Skill test (Stenography) and Medical which is schedule to commence wef 07/06/2016. CRPF will conduct written examination for Constable Tradesman from 15.05.2016. CRPF Constable Admit cards will be available shortly. You can download it from below.Central Reserve Police Force (CRPF) had completed the application process for 3163 posts of Constable (Technical and Tradesman). For getting selected to these posts candidates have to qualify 5 stages of recruitment that includes PET/PST, Written exam, Trade test, Medical and Merit list. First CRPF will conduct physical test. CRPF will organize physical test of Head Constable (min) from 01 July 2016. Admit cards are available now at above link. "PST/Scrutiny of Document phase will start from 01 July 2016 at designated centres. 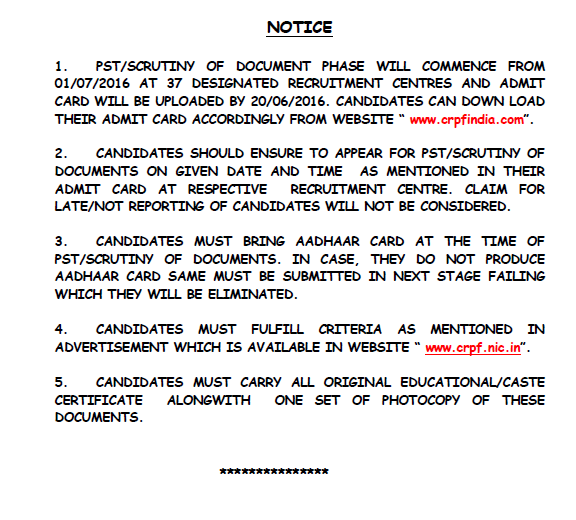 The admit card of CRPF HC Min will be uploaded by 20.06.2016. 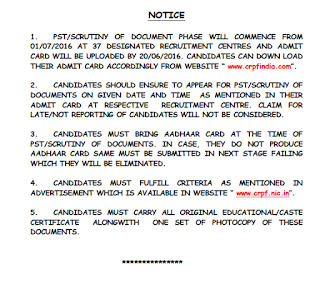 Candidates can download the admit card from below given link. The written examination for Signal Staff exam is to be held on 03 July 2016. Written examination for candidates who qualified in PST/PET of Signal Staff will be conducted on 03/07/2016 (SUNDAY). Stage-I Physical Standard Test(PST)/ Physical Efficiency Test (PET) will be held from 30 March to 20 April 2016. Physical Measurement / Standard test. will be qualifying in nature. Stage-IV Medical examination and checking of Testimonials/Review Medical Examination. 3. Uploading Result of PST/PET and admit card for Written test : 30/04/16. 4. Conduct of Written test at all Recruitment Centres (Timing 10:00 hrs to 12:00 hrs. : 15/05/16. 5. CRPF Admit card for written test will be released around 1st week of May 2016.
examination will be uploaded on the website www.crpfindia.com and you can download them from below given direct link. For any queries candidates may contact helpline 011-24368630. PET/PST was held from 30 March 2016. Written test is to be held on 15 May 2016. CRPF Constable (Tradesman) Admit card is available now. Each eligible candidate can download it via the below given link.